I completed this review as part of my studies for INF530- Concepts and Practices for the Digital Age, the fifth subject in my Master of Education (Knowledge Networks and Digital Innovation). While the book is not specifically written for the education field, it is as relevant for teachers as it is for businesses. I would recommend having a read! Bingham, T., & Conner, M. L. (2010). 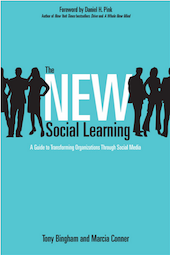 The new social learning: A guide to transforming organizations through social media. Alexandria, VA: ASTD Press. ‘The New Social Learning: A guide to transforming organisations through social media’ by Tony Bingham and Marcia Connor (2010) presents an extensively researched, theoretical based analysis of social learning and social media that was written to provide organisations with practical ideas and advice on harnessing the potential of learning through social media. Through interviews and case studies, readers are presented with authentic examples of how the direct and open use of social media in the workplace can positively impact learning amongst employees. Bingham and Conner (2010) have delivered a book that goes against the usual ‘marketing focussed’ social media perspective to review a range of social media tools including micro-blogging, video sharing, collaborative tools such as wikis and immersive environments and virtual worlds. The authors comment on how each of these tools has a direct impact on developing employee learning potential, building communities, developing a positive learning culture and growing collective intelligence. Moving away from the marketing focussed perspective of social media allows the reader to gain insight into the deeper theoretical underpinnings of this ‘new’ social learning. Social learning has now become a strategy that encourages knowledge transfer and allows people to connect in ways that were not previously possible (Bingham & Conner, 2010). This review will analyse the two key themes presented throughout the text, social media as a tool for social learning and the changing workplace and the nature in which people learn. Bingham and Conner (2010) have included sections titled ‘Respond to Critics’ in which they attempt to articulate helpful ways of responding to critics who have negative views of social media as a tool for learning. While their suggestions could be considered helpful, these sections lack depth and detail and offer only a few practical solutions for dealing with tenacious critics. In reviewing this text, these ‘critics’ sections will be analysed for their practicality and usefulness. Social learning is learning that occurs with and from others. Rightfully so, this text describes the ’new’ social learning as a fundamental shift in how people work, leveraging how people have always worked in the past, augmented with new social media tools (Bingham & Connor, 2010). Research suggests that social learning theories place an emphasis on authentic, real-world interactions between people in the learning process (Ford, 2008). Social learning is not new, and Bingham and Connor (2008) identify this, suggesting that social tools become the ‘building blocks’ in a way that development and learning is enabled in organisations. This concept is reiterated in a discussion by Coleman and Lenox (2010), suggesting that social media tools enable a higher level of social learning as they have the ability to allow for faster and wider access to people and resources. Social media tools allow people to connect and collaborate despite geographical boundaries. Having these resources so easily accessible in a learning context can provide people with greater access to knowledge. This easy access to knowledge can revolutionise previous theories of social learning as learners can and will come to expect that learning can take place anytime, anywhere and with people they have never met before (Brooks, 2009). Bingham and Connor (2010) rightly explain that social learning is not at odds with formal education and training, nor is it synonymous with informal learning. This idea of social learning is important. Social learning should not be something that is considered an ‘add-on’ or an extra. As Bingham and Conner (2010) propose, when learners engage with others, they are able to build on their own insights, reflect and interpret information in greater depth allowing for higher order learning to take place. An important point to consider from ‘The new social Learning: A guide to transforming organisations through social media’ (Bingham & Connor, 2010) is the emphasis placed on not just allowing people to use the tools and then getting out of the way, but designing an inclusive model where all learners are encouraged to use tools to create, publish, remix and repurpose their learning. As an example, Bingham and Connor (2010) discuss how micro-sharing sites such as Twitter allow users to access the ‘right’ people, no matter where they are. They go on to propose that learning often involves people asking questions, generally, of those around them regardless of whether or not they know the answers. According to other sources, using sites like Twitter allows learners to ask questions and gain insight from a dramatically larger audience, becoming the lead tools in sharing knowledge (Brookes, 2009) across the globe. With this evidence elaborated, it can be confirmed that Bingham and Connor’s (2010) idea that new social learning through social media tools can allow organisations to have the ability to build positive online communities, connect and collaborate globally and develop positive learning cultures. The discussion presented about social learning by Bingham and Connor (2010) is factual, and their ideas are synonymous with other research in this area. The connections they make to social tools enhancing and strengthening the learning process are research driven and allow readers to gain a deeper understanding of how social tools can have a positive impact on the way people are already learning. A key theme in ‘The new social Learning: A guide to transforming organisations through social media’ (2010) is the changing nature of the workplace. Bingham and Connor (2010) suggest that people are already using social media to collaborate and learn; they are working together more effectively and using these tools to create more vibrant learning communities and opportunities. In discussing this ‘changing workplace’ Bingham and Connor (2010) share the idea that Generation Z (those born after 1997) are about to enter the workforce. Suggesting that his generation is more accustomed to online technologies and, as a result, demand instant answers and constant connectivity. For organisations and educators, this understanding is momentous. Coleman and Lenox (2010) explain that one of the most overlooked concepts of social networking is the ability to “do your job”, that by allowing learners and workers access to this technology they are allowing them to create, research, develop, deliver and evaluate projects. Using social media tools in this way enables workers to create their own ‘personal knowledgebase’ or Personal Learning Network (PLN). Learning in this way can enable a deeper level of tacit knowledge transfer. Workplaces that develop ways for their employees to share this tacit knowledge widely through the means of social media gives them a unique resource and competitive advantage (Johnson, 2009). Modern workers are driving economies, driving technological advancements, making decisions, solving problems and driving innovation, they are communicating and collaborating with others in order to meet the needs of their customers (Libin, 2013). The changing scope of workplaces are ‘punching through’ walls and using technology to enhance the learning space (Bingham & Connor, 2010). This is the same for schools, allowing students to develop these networks and learn in this way can develop higher order thinking and the opportunity to enhance and access greater knowledge across subjects. Bingham and Connor (2010) are successful in their connections between enabling the new social learning and how this can have a successful impact on the changing nature of the way people learn. Throughout the text Bingham and Connor (2010) question and respond to the ideas of critics and the ‘learningfulness’ of using social media. These sections offer an element of positive insight into what to say to critics when it comes to social media for learning, but lack depth and sustainable ideas. Bingham and Connor’s (2010) views almost seem flippant when comparing being critical of social media to suggesting that critics think it is “dumb” or “dangerous”, going on to suggest that people should not just quash social media because they do not understand it, rather, learn from those who do. These are key points; however, it should not be forgotten that those who question the effectiveness or are critical of social media as a tool for learning may not see it in a negative light, but are viewing it with a more well-rounded scope, where both positives and negatives are conceptualised (Brooks, 2009). Gotten and Woodrow (2007) also suggest that ‘believers’ may not always listen adequately to those who have critical views, in fact, they go on to say that critics are well in their rights to have these views, and sometimes their concerns are correct. Being critical of something does not always mean that people think what is happening with social media is dumb or dangerous, Bingham and Connor (2010) needed more substance to hold these sections together to offer more depth in their advice. Brooks (2009) discusses the notion that stakeholders often embrace or reject technology before they have a clear vision of how it can complement or confound pedagogical approaches, they go on to suggest that stakeholders work together to change or shape policies so that social media can be used effectively and that all involved can take advantage of the tools and the level of social learning they can provide. When analysing the state of play in this new idea of social learning in education, especially when it comes to when it comes to critics, educators, organisations and stakeholders could benefit from the advice of renowned psychologist Abraham Maslow (1966), where he discusses the ancient proverb “If all you have is a hammer, everything looks like a nail”. Maslow (1966) describes the ‘fear of knowledge’- when people take something new on board they need to have trust in the knower, overcome their fears and become growth motivated. Those who are open to social media as a tool for learning need to have a well rounded understanding which can help fight the resistance, Maslow (1966) explains that, without this understanding, there will be resistance. Offering a deep understanding to critics is the first act, the advice given by Bingham and Connor (2010) in the ‘Respond to Critics’ sections are the initial understandings and relevant ideas needed to overcome the resistance. Overall Bingham and Connor (2010) are successful in presenting a book that offers a theoretical underpinning of how social learning through social media tools can have positive influences on learners. Their discussion of the new and changing workplace, and the new generation of learners is thorough and synonymous with relevant research. They have presented relevant ideas, case studies and practical advice to dealing with critics and nay-sayers of social media for learning, however, may only be scratching the surface. Brooks, L. (2009). Social Learning by Design: The Role of Social Media. Knowledge Quest, 37(5), 58-60. Golten, M. M., Smith, M., & Woodrow, P. (2007). Hammers in Search of Nails: Responding to Critics of Collaborative Processes. CDR Associates, Boulder. Johnson, J. D. (2009). Managing knowledge networks. Cambridge, UK: Cambridge University Press. Libin, P. (2013). Day Two Keynote. Evernote Conference 2013. San Francisco. Maslow, A. H. (1966). The psychology of science; a reconnaissance. New York: Harper & Row. ← And they said I was too adventurous?